In the first week of January, 1812, a party of trappers and traders, members of the Astor Overland Expedition, crossed the Blue Mountains in this area. Traveling afoot in bitter cold, often waist deep in snow, they were the first white men in this area. 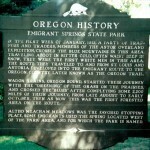 The route they traveled to and from St. Louis and Astoria developed into the emigrant route to the Oregon Country later known as the Oregon Trail. Wagon trains, Oregon bound, started their journey with the “greening” of the grass on the prairies, and crossed the “Blues” after completing some 2,200 miles of their journey, from late August to early October. Then as now this was the first forested area on the route. 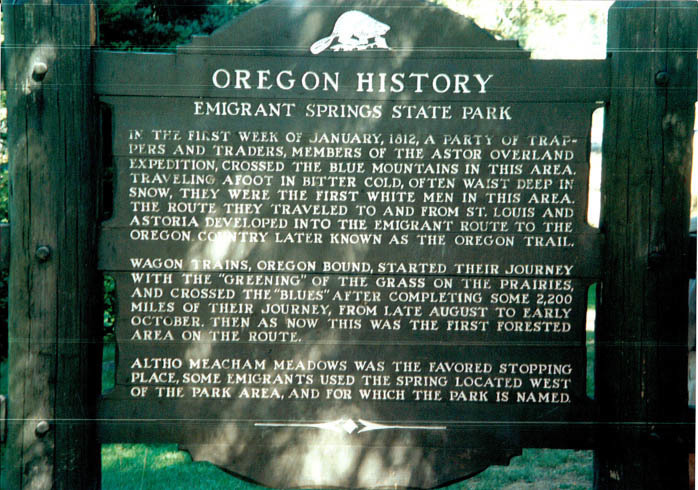 Although Meacham Meadows was the favored stopping place, some emigrants used the spring located west of the park area, and for which the park is named.